This won’t go down as the best example of journalism in the world, but the ten minutes or so of gameplay that we were allowed to see was so amazing that we forgot to take any notes for about seven of those minutes. Hastily, we then scribbled ‘Wow – great lighting, shadows. Textures looks [sic] brilliant,’ followed by something unintelligible because we tried to write it while looking back at the screen. 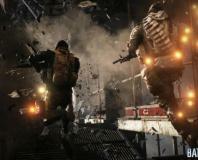 Short story: Battlefield 3 looks superb. 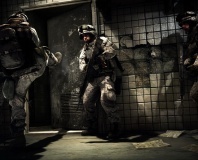 The basis for the eye-candy is the much-talked-about Frostbite 2 engine; an evolution of the excellent Frostbite graphic engine used in Bad Company 2. The easiest way to show how the five pillars of the Frostbite 2 engine combine is with a video – unfortunately it features some naughty language, so please turn your speakers down if you’re of a sensitive disposition. Just like Crytek with Crysis 2, Dice has borrowed the ANT character animation technology from EA’s sports titles, and the result is eerily realistic. Soldiers move in a natural, human way when walking or shot by enemy fire – the unfortunate marine that got shot in the head while standing in the middle of the car park crumpled in a disturbingly natural way, we noticed. We saw more of the above firefight in our watch-along preview, with the clarity of the grotty area proving particularly impressive. Oil stains on the battered concrete looked as grim as in real life, while the textures of the cars and buildings looked convincingly grimy. While we didn’t see any of the promised open areas that Battlefield 3 is set to deliver, the Tehran-like setting looked and felt authentic – the roadblock and the torn Tarmac, plus the smoke and sunlight effects, all enhanced the feeling of an urban warzone on the Iraq-Iran border. The audio is also described as being a part of Frostbite 2, and Dice has paid attention to making the sounds distinct and recognisable. Sniper fire has a powerful punch to it, while the marines’ rifles have a different tone as bullets growl from the muzzle. It helped that Dice had set up a fierce speaker system for its demo, but with a bit of practice you’ll be able to tell what kind of firepower you’re up against just by listening as you cower behind a parapet or burned-out car. That knowledge can make all the difference in a game as tactically deep as Battlefield 3. Not that you can hide behind cover for too long, however. As with Bad Company 2, the scenery is highly destructible – we saw sniper fire chipping away at a concrete wall as the squad crawled to a better vantage point, so hanging around isn’t an option. The level of damage dealt to scenery looked accurate too, as the sniper rounds took fist-sized chunks from the wall, while an RPG took out most of a tower block. Unfortunately, the pre-alpha build we were watching crashed before the finale of the Faultline level, where the entire city is wrecked in a massive earthquake. 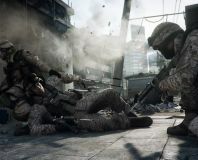 At the moment, Battlefield 3 is only running in DirectX 11, and Dice couldn't tell us whether a DX9 mode will be on offer. EA is not planning to include online passes with its future titles according to John Reseburg. DICE architect Johan Andersson has revealed that future Frostbite games will be 64-bit exclusives. 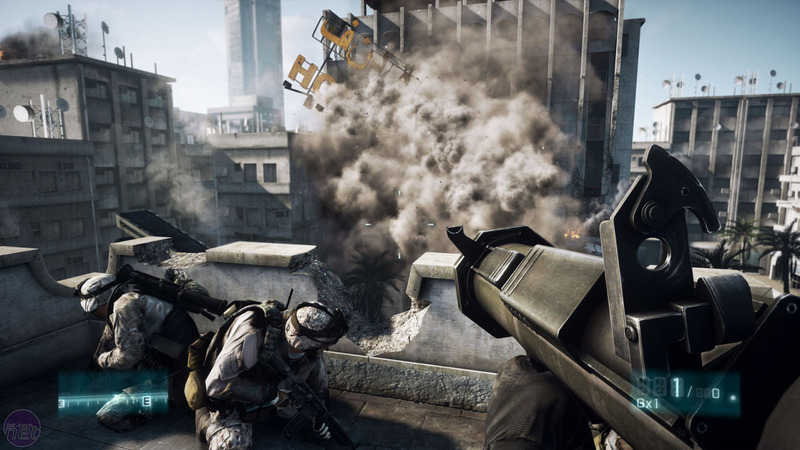 Dice community manager says two GeForce GTX 580s in SLI will be needed for Ultra settings.